Becky Blue on Sewing or sowing? Trish Jacobson on Sewing or sowing? Lori Bjorklund on Sewing or sowing? What words are you made with? Two pounds of ground beef from my brother Paul’s farm drops into the hot stainless steel soup pot and quickly sizzles. It is soon followed by canned tomatoes, all sorts of chopped vegetables—cabbage, carrots, celery, potatoes, and a critical mix of salt, thyme and basil. Two bay leaves are carefully chosen to swim on top. Oh, and don’t forget the barley. It’s a soup kind of day at our house. Can you smell it? This comforting culinary routine has been passed down through generations of Blues since my mother-in-law first discovered the recipe in a Successful Farming magazine in the late 1950s. I can’t imagine how many times this recipe has been prepared by her and others over the past sixty years. 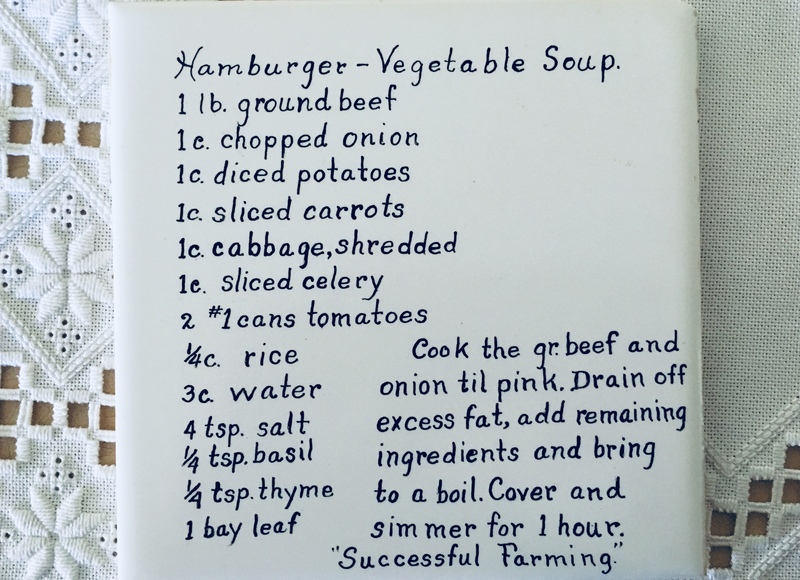 This Hamburger Vegetable Soup is legendary in our family, just read the kitchen tiles. The white tiles that you see in the photo above capture so much love. Each square tile has a combination of my mother-in-law’s handwriting, a favorite family recipe, and a story. These tiles were placed in their Black Hills home when it was built in 1978 and they are actually the second set of tiles. The first set were conceived when my in-laws moved into their brick home on Grange Avenue. In 1967 young mom, Barbara Blue, wasn’t busy enough chasing my husband, Dan, and his little brother, Dave, around. She decided she could accent her new kitchen by handwriting favorite recipes from family and friends onto white tiles and interspersing them with colorful Norwegian accent tiles honoring her heritage. Of course when they left that house the tiles had to stay. No problem. She made more. Just like making another batch of soup or Joyce’s Buns or Chocolate Sheet Cake. The writing is on the wall. This is an amazing woman who feeds the souls of her family, friends, neighbors, and also random repairmen, tourists stuck in the snow, and most certainly their pastor. Navigating the kitchen started early in her life. As a teenager she was asked to help Mrs. Larson, the neighbor down the block in their small town of Beaver Creek. Mrs. Larson was recovering from a mastectomy and couldn’t use her right arm to whip the egg whites for angel food cake. Young Barbara was happy to help with the baking and she scrubbed the floors, too. I can just picture that little dark haired angel whipping those twelve egg whites into a perfect cake. Her next cooking assignment was at a farm about one mile out of town. She recalls walking the railroad track the one mile to the farm to help the farm wife cook for the threshers. Apparently the successful farmer insisted on fresh cookies everyday for his crew. This cooking for a crowd could explain why Barbara sent one dozen sandwiches with her new husband, Bob, the first day of work after their wedding. This story is told often when we’re enjoying Grandma’s homemade bun recipe. She couldn’t figure out why he wasn’t hungry for supper. I truly owe my love of cooking to Barbara Blue. She taught me years ago how to bake pies and I have yet to find a better pie crust recipe than hers. It is laden with white Crisco. (Don’t judge.) I think she knew that my husband would always request a pie, rather than a cake, for his birthday. In 1982, his first married birthday, I stepped up to the challenge and baked him his mom’s Strawberry Pie recipe for the first time. 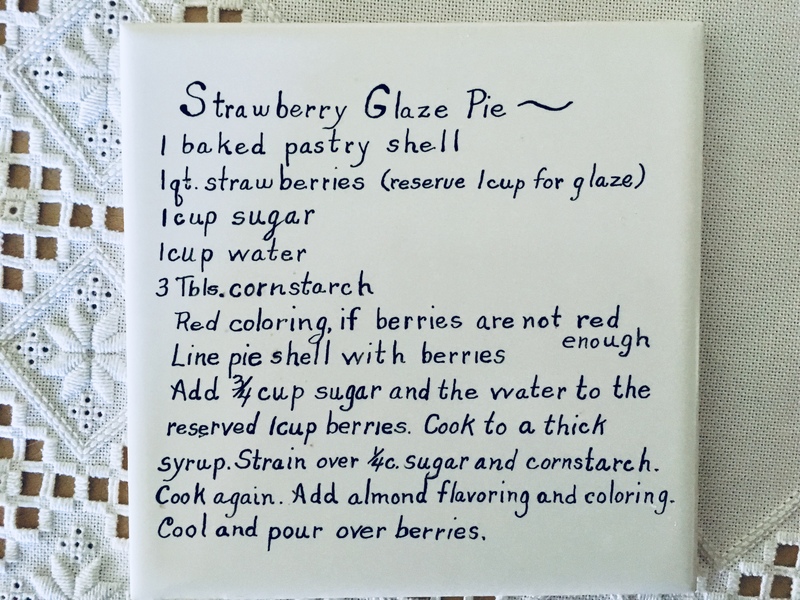 (Another tile that is on the wall and legendary recipe—it deserves the capital letters.) Fresh strawberries, a bit of sugar, a bit of almond flavoring, really, how hard could it be? Honestly, I’m still wrestling with this pie recipe after making it many times over the past thirty plus years. Everything, including the direction of the wind, impact it (or maybe I just shouldn’t cool the filling on our deck railing.) I’ve attached the recipe at the end of this post. Give it a go! The day I photographed Barb by her tiles, she reminisced about the recipes and even recalled the name of Mathilda Thomas, the china painter who fired the first set of tiles. She described strategically placing the soup recipes over the cooktop and the breads and bars and cake recipes by the baking area. 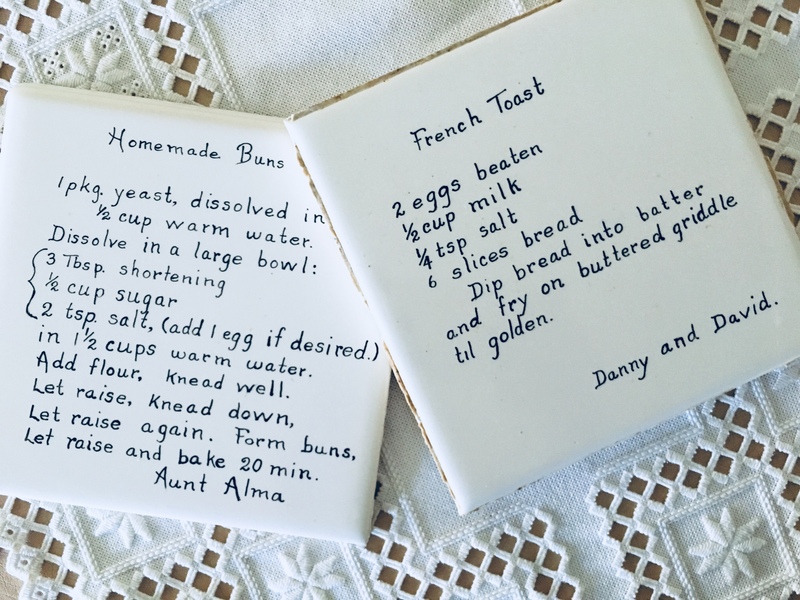 The Gingersnap Cookie recipe from her mom, Dorothy Thompson, caught my eye. I’ve tasted this delightful spicy cookie but loved hearing her describe how she uses the palm of her hand to make each cookie as thin as possible. Just as her mom did. A good dunking cookie as I recall. At almost age 85 she is still strong and active and bakes and cooks and feeds souls. The happy side story here is that the tiles from the first house were recently recovered by my son, Elliot, and my husband, Dan. They carefully, with relative ease, were able to remove each tile safely. The Strawberry Pie, Hamburger Vegetable Soup, Rhubarb Crisp, and Danny and David’s French Toast, along with two dozen others, are just waiting to be made. I guess we really are made with words. Give these recipes a try and let me know how you like them. Tip from Barb: Use barley in the soup instead of rice. Hearty!  Archived in words and tagged cooking, family recipes, traditions. Bookmark the permalink. Awesome story of warm memories. Thank you Becky! You’re welcome, Ruth! No doubt we have similar memories of great cooks and rural South Dakota. This is awesome! What a treasure to have those original tiles. Thank you, Clare! Yes, just figuring out how to best share them with more people. They really are a treasure! Your class at Plum was so fun today! What a neat story of faith, family, and food! Oh, Caryl, thank you for your kind words! Loved meeting you. It was such a fun morning! I saw that you had a class at Plums and was sorry I couldn’t go as Barb and Bob were friends of my parents , Lois and Elmer Tursam, from Our Saviors as well as Boy Scouts. Today I got a copy of the book and am so impressed by it. So much fun and great memories! Thank you ! Paula, so fun to hear from you! I recall Dan’ parents visiting about Lois and Elmer. I’m thrilled that you are enjoying the book! Such an honor to write it and now have the stories and recipes being shared. I just took some of the Shortcakes out of the oven. We’ll try them tonight. Happy cooking! I’m going to forward your note to Barb. She will love it! Such a delightful story Becky and an honor to your dear mother-in-law, I have one who is a wonderful cook/baker also. I’m going to order the cookbook right now as a wedding gift for our daughter, Heidi, who is getting married in August. She will LOVE it and the story behind it!! Also, love the fact that you and Julia got to do this project together!! a movie that Cindy made from the cooking class. Really fun to see Barb in action in the class. Pretty amazing for 85 years old! So glad you’re sharing Heidi! She’ll enjoy the recipes.